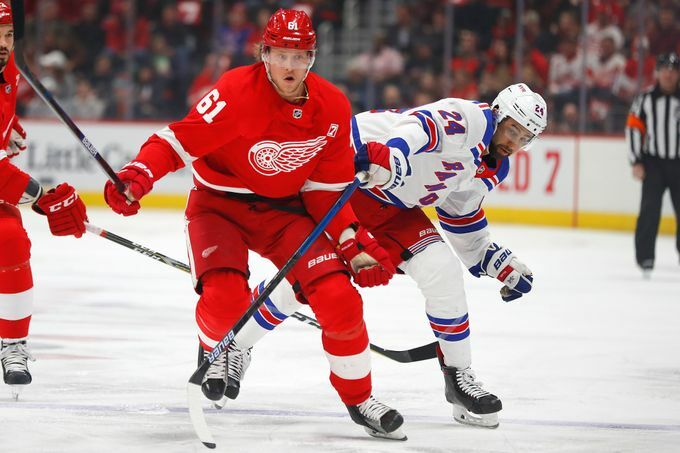 Pavel Buchnevich notched a pair of goals, but the Rangers were completely dominated by the much worse Detroit Red Wings, falling 3-2 in the shootout. Buch scored the first goal of the game in the first, then tied the game late in the third. Henrik Lundqvist had to be great again, making 43 saves. Brendan Lemieux also added a pair of assists. Libor Hajek almost got his first point, but had his assist on Buchnevich’s first goal removed. He had another strong game though, so this kid is looking like he belongs. The Blueshirts remain winless since the trade deadline, although they have taken a bunch of these games to OT and beyond. They’ve now taken 20 games to the extra frame, which is beyond frustrating for a team that hasn’t even won 25% of those games. From a tanking perspective, those points are killing them. But it is instilling a fighting mentality into the roster. That is equally important. Buch had three attempts here and simply would not be denied. He was a force in this one. Hajek did not have the assist here. Tyler Bertuzzi was getting mauled in front by Tony DeAngelo and he still managed to get his stick on the Madison Bowey shot. That’s just good net front presence. This doesn’t really show the full play, but Andreas Anathasiou unleashed a rocket on this shot. Hank stood no chance. I would have liked to see Brady Skjei play this a little better by not giving Anathasiou so much room to shoot while also covering the pass. I’ve been on this all year though. Per Vally’s in-game review a few months ago, Skjei wasn’t overly committed because he was still in the middle of the ice. My gripe is with the five feet between Skjei and Anathasiou when he shoots. I’m probably nitpicking though. This was a stellar pass from Lemieux and an even better finish from Buchnevich. This is basically what you expect for this kind of game. The Wings had 65% of the shot attempts, and basically owned the game from start to finish. The Rangers head back to New York for a quick game against the Devils before heading out West for a few late games. It will be interesting to see who the next batch of healthy scratches are. Rykov’s season is over, but KHL contracts usually expire after the Rangers season will be over. Drafted as a 20 year old, his ELC will be 2 years before becoming arbitration eligible, would have 3 years(or 70 NHL games) of waiver exemptions. If they can get him in early, might be worthwhile to burn that 1st year now as a free look or go home maneuver. I really like the game of Bendan Lemieux. He’s one of those rough neck players with enough skill to play in the top 6 but wouldnt be lost in a checking line roll. Strong pickup by Gorton. I like what the addition of Lemieux is doing for Buch’s Game . He’s a new player. Staal should have sat seeing he was sic and Shatty should have dressed. Maybe Kreider nursing a injury ? Bendan Lemieux, Lindgren, ADA, even Smith all will make this team hard to play against. I think next years version will not be pushed around as we have the last few years! As for last night’s game, there were some good things that came out of it, like Buch is playing with a purpose, while we lost again in the shoot out. I wish they would make it such that if you lose in the OT-Shoot out, you get no points. If they did that we’d see some fierce play at the end of a game because they get the winner points, and a kiss by their sister’s for going into OT! PS – JoeS dropping a little of the codones out of the mix , today and tomorrow will probably be the worst of it and I appreciate ur concern the other day on the matter. Just following Doc’s orders and don’t wanna fall behind on pain management ? , so again thanks for that ! If you lose in the OT you get nothing. Both teams only get the point after the 3v3 OT which will limit the shelling and waiting for a loser point. If they lose in OT and get nothing we would be back to 20 years ago when teams played not to lose if the game was tied for the entire 2nd half of the 3rd period thru overtime. It would be like watching a PEEWee Hockey team practicing their passing drills. The loser point is not ideal but is a necessary evil. Hear, Hear! Walt and Hockey Post, I like what I’ve seen of Lemieux thus far. The kid has some skill and is feisty, a yapper who knows how to play the game. I was delighted when ADA went after Erickson who is a head taller than him because ADA took exception with Erickson’s hit on Chytil. These kids stick up for one another. Good stuff. Did you see Lemieux on the bench making sure he got a laugh out of Mika? What a character…..Mika is like “what do I make of this guy”! ADA will drop the gloves with anyone who takes liberties against a teammate, just ask Okposo!!!!!!!! After watching last night, I feel less inclined to believe we are only 1 or 2 players away from being a good team. THe Red Wings looked to be an inferior team, but found ways to win a game that we should have. We do not get enough high quality chances. Our defense ends up running after players rather than playing positional defense. You cannot expect the first line to be a force every night, so we need stronger 2nd and 3rd lines. We just are not there yet. We have given Howden and Chytil a year to grow, but neither is budding into a top line player. This is an important draft for us, and we need to make moves to get more first rounders or to move up in the rounds. I can only hope we draft some late-blooming stud, because we need a hero badly. Remember chytil was drafted a year early. Because of his age. He needs one more season howden I think has flared out. We have many assets to trade up with we just need some people to drop their nmcs. Decent assets to help trade up in the draft plus we have 5 picks in the first two rounds. Only a moron wouldn’t be able to do something with that to get in the top 3 on th boardat the draft. None of the 1st 3 you mention will move you up in the draft. It would be part of cap manuveuring if anything. Hank IS NOT moving his NMC. So your saying anyone can convince teams that are bad to give up on sure things like Kakko and Hughes by taking older and overpayed players or giving them a few extra unknown 18 year olds? Serious question…if we happened to land the #2 pick, would you trade it away for another team’s older and overpriced veteran + a few extra mid to lower 1st rounders? just offer them fast and they will take it. Truth, you’re way off base in your assessment of Chytil in particular. There was a good article on another Ranger blog about how Chytil’s 19-year old NHL season stacks up against other, currently elite players’ 19-year old seasons. To summarize: Chytil is having a better year at age 19 than Tyler Seguin did at age 19. His age-19 season with NYR is directly comparable to Nikita Kucherov’s and Alex Barkov’s age-19 seasons. Obviously this is no guarantee of future NHL success for Chytil but it puts his season into sharp perspective. So sick of the impatience with this fanbase. Quick fixes with a side of desperation have been the Rangers’ mode of operation for over 50 years. Talent takes time to develop, and Chytil’s skill and potential are self-evident. If you cannot see it perhaps curling, baseball, or bocce might suit your perceptual skillset a little better. Chytil, Lias and Howden are young – yes, but none of them have shown any ability to be a game breaker, not even a glimpse. You can keep hoping that these players continue to blossom, as I do as well, I just do not see the level of talent needed to take some very big steps. We also need much more talent overall on this team. We have some guys with grit, but give me some snipers. No one on this current team is a 30 goal scorer except for Zibby. You shut him down, and you shut down the team. We need 2 more 30 goal guys and 2 significantly better defensemen. Are these guys in the system? I would say not for 2 more seasons. This puts us as a non-playoff team for 4 years. That is not a retool Mr. Gorton, that is a rebuild. When you pay more that $100 for your seats, you can want more from a team than just grit and overtime losses. Read the article, Truth. Not gonna name the blog or writer here but search under the term “Chytil 19 year old season comparison”. Or don’t, and feel free to continue in your ignorance. All the same to me. Disagreement on opinion is not ignorance, but the ability to see other’s opinions is. Statistical evidence is not an opinion, it is something that exists in actual reality. The article you speak of is interesting, but hardly a barometer for predicting the future. Yes Chytil compares favorably right now, but there are too many unknowns and player combinations that the other players have had to draw distinct comparisons. Chytil has a bright future, but it is too soon to say that he is going to be great or going to be average. Or you could ignore that here in this post as well. Truth, why the hell would you expect anything less? We traded away Stepan over a year and half ago, then Nash, McD, Miller and Grabner 1 year ago … then we traded Hayes and Zucc a couple of weeks ago. Of course we’re more than 1 or 2 players away from being a truly good team, we traded away our top d’man and circa 5 of our Top 6 forwards plus a great Top 9 forward all for guys under the age of 20-21. DOH! … and about Chytil, you’re wrong … I love how you gave an 18 year old 1 year to grow into a budding top line player. “Truth”? More like “Nonsense”. deja vu all over again….. Yes, this team will get tougher to play against, but we will still need an elite player or two to mesh with the youth….the amount of money that Karlsson or Panarin will demand will be in the MT. Rushmore vicinity and I am not a fan of Karlsson anymore….age and a few other concerns………If Rangers do not get involved in any free-agent signings during the off-season….then this rebuild will take a few more years…no question about as we have several players with a few years remaining on some ugly contracts…. Rock, EK coming to the Rangers I feel is writers trying to generate some buzz, EK is not the target on the blue line. We compete not to compete. That is the question? to play hard but not to win is another game we are playing. Welcome to the fast report. In this volume of the fast report we will discuss what fast did during the game. And that was the fast report. Brought to you by the emperor has no clothes. Also with give me that fillet a fish give me that fish. And The out houses is where the smell goes. Well that was, dare I say, fast…. It’s Lent, so he’s Fasting. Brandon Lemieux and Ryan Strome have been excellent additions to the core of this team. We need help for Chytil, as the two mentioned will fit with Lias Andersson. That help has to come via the draft. Kravtsov is going to go to the top line at some point. So either Kreider or Buchnevich are gonna be line mates of Chytil. What does Chytil need? Scoring winger? Grinder? The best two in this draft to do both are Cozens and Podkolzin. I prefer Cozens because he is a right shot and plays center. We need to pick at 4 to be assured of one of them. I highly doubt we fall in the top 3 or win the lottery to move up and pick 1 to 3 range. Yesterday was a great indicator of what is missing aside from consistent scoring. It also showed their battle level. It showed that our grass is green right here…not on the other side of the fence. Our defense needs help but you know what? I watch the Knights regularly and by those standards exhibited here, so do the Knights. Did Vegas just rent Mark Stone till the end of the season? When you say ‘signed’ does that mean I should be seeing info on a signed contract with Vegas ‘beyond’ this season? I’m not seeing any…..
We continue to gather useless points. Just lose in regulation and save yourself some agony. We like to do it the hard way !